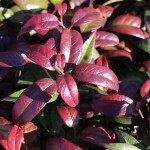 An evergreen shrub with arching branches, and leathery, shiny dark green leaves in the summer. In spring, clusters of white urn-shaped flowers appear, hanging beneath the branches. 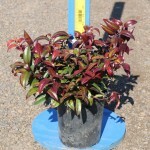 The fall and winter color is purple-red. It is a native to Virginia south in the Eastern U.S. It will grow in average, medium moisture, well-drained, preferably acidic soil. It will grow in full sun with adequate moisture and protection from drying winds. Use in a rock garden, border, as a foundation plant, or under larger shrubs and trees.